order now The process to build the SDSU West project on the site currently occupied by SDCCU Stadium is officially underway. Representatives from San Diego State University held a series of scoping meetings on Jan. 29, 30 and Feb. 7 to gather public input on the proposed project. http://www.santacruzpumas.org/research/ order now At the Jan. 30 meeting held at the Mission Valley Marriott, SDSU Director of Planning Laura Shinn said the meeting was the first step in a year-long process in creating a plan for the project with the goal of having it approved by the California State University Board of Trustees by January 2020. 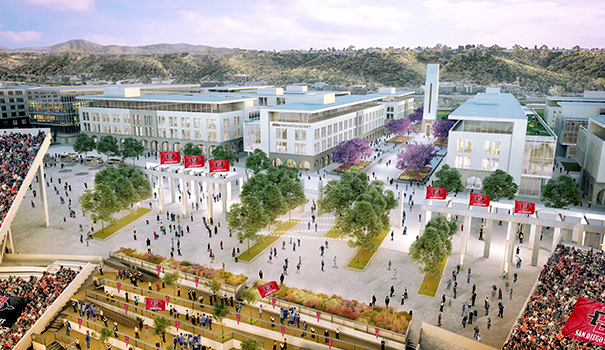 Shinn pointed out that the vision for SDSU West extends beyond the needs of the school and is being developed with benefits for the entire San Diego region in mind. “This is one of the last really undeveloped sites, one of the good opportunities to do some development and it’s right in the heart of San Diego, so that’s really important and we take that charge very seriously,” she said. The project, as it is presented now, will have 83 acres of open space — 34 of which will be a river park built and maintained by SDSU, but owned by the City of San Diego. A 35,000-seat stadium for the SDSU Aztec football program will also be available for community events, concerts, professional soccer matches and more. The campus portion of the project will offer 1.6 million square feet of capacity. The project envisions this as a combination of research and development labs and office space for faculty and staff, as well as industry partners. “We have a lot of faculty and staff across all of our colleges that are partnering now with industries to do research and development and we want to be able to create more opportunity for that,” Shinn said, adding that building new research spaces is easier than trying to fit them into existing buildings. The project also allows for 4,600 units of residential housing. Shinn said this is an opportunity because SDSU currently has no on-campus housing for faculty and staff, but added that the housing will also be available to community members who do not work at or attend the college. Ten percent of the units will be designated as affordable housing. In addition to residential housing, the plan calls for 400 hotel rooms between two hotels — a limited-service hotel and full-service hotel complete with restaurants and a large conference space. “That conference space will be important for our campus and industry partners so they can hold things like symposium meetings,” Shinn said, adding that it will also be utilized for events like alumni fundraisers and celebrations. The 95,000 square feet of retail space in the proposal is intended to be “neighborhood-serving” outlets like restaurants and a grocery store for people who live in the area. Although there are no more scoping meetings scheduled, comments on the initial plan will be accepted through Feb. 19. Mail hard copy comments to: Laura Shinn, Director of Planning San Diego State University, 5500 Campanile Drive, San Diego, California 92182-1624. Email comments to: mvcomments@sdsu.edu. Comments on the project will be looked at and considered as the project’s draft environmental impact report (EIR) is being prepared. The draft EIR is slated to be completed by this summer and will include comments from the scoping, a fuller description of project, description and analysis of alternatives to the project, an analysis of the projects impacts and proposed mitigation for the impacts. There will be a 60-day comment period for further input on the project before the final EIR is released and sent to the California State University Board or Trustees for a vote in early 2020. That meeting will be open to the public for additional comment. For more information about the SDSU West plan and to view the presentation, visit sdsu.edu/missionvalley.